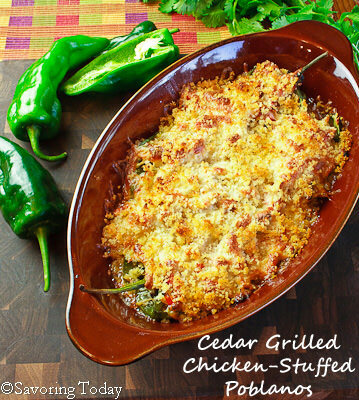 Cedar Grilled Chicken-Stuffed Poblanos has been in my recipe folder waiting to be shared for a year. No kidding. I first made it last summer, but since I was moving at a snails pace, by the time it was proofed and ready for posting winter set in and grilling season had passed. Now that sandals and sunbathing are priorities again, it’s time to peel off the grill cover and cook with fire. And planks of cedar. Recipes for salmon on cedar plank may be more common, but I like to use them for chicken breasts, pulled chicken sandwiches, and boneless pork ribs. Planks are easy to work with and bring a slightly sweet nuance of wood flavor to the meat. This recipe is inspired by the Applewood Chicken-Stuffed Anaheim dish we enjoyed at Hacienda Colorado while celebrating a friend’s birthday—it was by far the favorite at the table. Don’t you love being with friends and tasting something so good you must share a bite with everyone? You’ve heard it before, “Really, you HAVE to try this!” That passionate plea to not miss what you don’t even know you’re missing. Hunt for a clean fork if you must. The smoky chicken, roasted peppers, jalapeno sauce, and lightly fried panko crust had my attention. Unfortunately, it was fried, but I ate every last cheesy crumb without guilt. I knew this dish would have to be part of my life on a regular basis, so it had to be revamped to create a healthier version we could enjoy at home. I don’t have a smoker, so I borrowed lessons from the recipes mentioned above and cooked the chicken on cedar planks to bring the wood flavor. Caramelized onions anyone? Roasted poblanos? Oh yes, if you ask me, caramelized onions are like a secret weapon in the World of Yum, subtly tantalizing, making everything better. Poblanos are ideal for stuffing because of their generous size and consistently mild green chile flavor. You can easily adjust the heat in the stuffing by the choice of green chile you use or adjusting the amount of Tabasco. The cilantro-lime cream sauce brings a nice balance to whatever level of heat you choose. 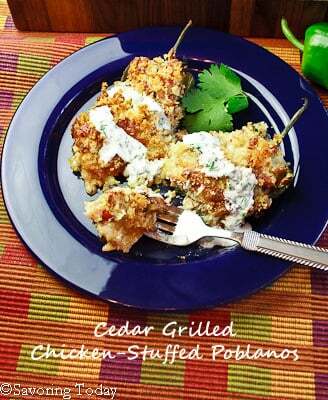 Roasted poblano peppers brimming with cedar grilled chicken, cheese, roasted peppers, green chile, caramelized onion, and christened with golden panko crumbs—really, you have to try this. Roasted poblano peppers stuffed with cedar plank grilled chicken mixed with cheese, roasted peppers, green chile, caramelized onion, and topped with panko crumbs. Soak cedar plank in water for at least 1 hour. While the plank is soaking, brine chicken and caramelize the onions. To brine the chicken, mix the kosher salt and brown sugar with 1 1/2 quarts of filtered water. Stir to dissolved the salt and sugar then place the chicken in the brine. Refrigerate while brining for at least 1 hour, up to 3 hours. To caramelize onions, heat olive oil and 1 tablespoon butter in a cast iron skillet over medium heat until oil covers the pan evenly and is hot. Add the sliced onions and stir enough to coat with the oil and butter. Cook the onions over medium heat, stirring occasionally until onions begin to brown, 5-8 minutes. Season with salt and pepper, spread onions evenly in skillet, and reduce heat to low. Allow onions to gently caramelize over the next 45 minutes, stirring occasionally to ensure they cook evenly. Add minced garlic to the skillet the last 15 minutes of caramelizing the onions. Onions should be deep, golden brown when done. Once done, allow onions and garlic to cool, then coarsely chop. While the cedar is soaking, the chicken is brining, and the onions caramelize, lightly roast the red pepper and poblanos on the grill or under the oven broiler. Normally, when roasting peppers you want them almost black, but this method will bring some roasted flavor without having to peel them. For the grill, halve the peppers and remove the seeds and stems. Roast the peppers, skin side down on HI on the grill until the peppers begin to blister and are dark brown, but not black. Remove the peppers before blackened and set aside to cool on a platter. If the peppers do become too dark and blacken, simply place them in a plastic bag for 10-15 minutes and peel them before proceeding with the recipe. This will not change the recipe, it just creates an extra step. Once the peppers are cooled, chop the red peppers and set aside. Place the halved poblanos in a greased casserole dish large enough to lay the peppers side by side with only a little overlap if necessary. When ready to cook the chicken, remove it from the brine and pat dry with paper towels. On a gas grill, place soaked cedar plank directly over medium heat and allow wood to get hot, 3-5 minutes. Place chicken directly on the cedar plank and cook over medium-low heat (this will depend on the grill, so you may have to adjust the temp to be sure the plank stays hot). Turn the chicken pieces over after 6-8 minutes, so that both sides make contacts with the wood plank during the cooking process. The meat will take on a yellowed, almost leathered look. The wood plank will char and smoke which is ideal. If the wood catches fire, simply spray those parts with a little water--avoid spraying the meat. Once the chicken is cooked through, transfer to a rimmed baking sheet and allow to cool until easy to handle. Once cooled, shred chicken by pulling it apart into small strips with your fingers. Preheat the oven to 400° while shredding the chicken. Mix the chicken, caramelized onions, red peppers, green chile, queso quesadilla cheese, and Chipotle Tabasco until well combined. Taste stuffing to add more salt and pepper, as desired. Place chicken stuffing on top of the poblano peppers in the casserole pan -- some peppers retain their shape, while others flatten out -- do your best to place the chicken so each one is distinctly separate. Sprinkle with additional cheese, as desired. 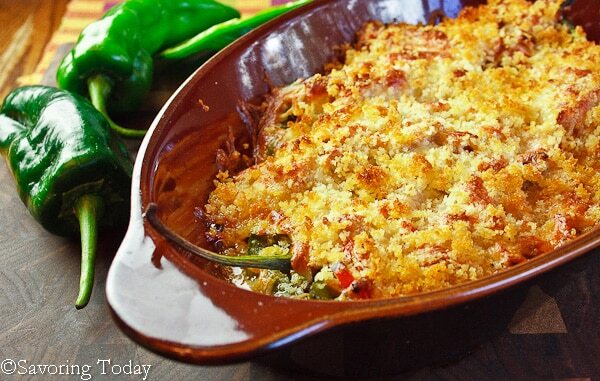 Mix bread crumbs with the remaining 1 tablespoon of softened butter and sprinkle on top of each stuffed pepper. Bake for 20-30 minutes, or until top is golden brown and cheese is bubbly. Mix the sour cream, cilantro, and lime juice in a small bowl. Serve at the table to drizzle over stuffed peppers. 4 pieces of chicken will yield approximately 3 cups of shredded chicken -- if the pieces are small, increase to 5. Any mix of white and dark meat will work. Prep time and cooking time overlap to reduce Total time. 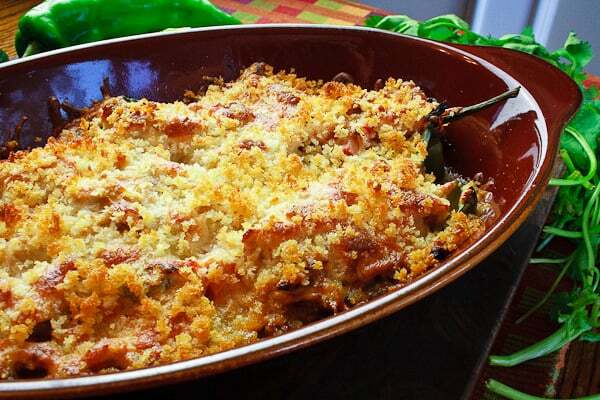 Complete the recipe, reserving the breadcrumb topping, and refrigerate. Bring to room temp for 30 minutes before baking. Sprinkle with breadcrumb topping just before placing in the oven. Omit the breadcrumb topping all together to make this dish gluten-free or sub the regular panko crumbs with gluten-free panko crumbs. I recommend using the gluten-free crumbs if possible, as the light fried-like texture in the topping is important to the dish. Everything about this recipe says, Yes! I must try making these, they sound delicious. What a wonderful dish just reading the recipe but the photos make me want to have it here soon. Delish recipe. Not what I expected and I love surprises. What a wonderful recipe, we have cedar planks in the pantry but I only have used them for salmon. This is such a great idea, love this. Looks like a lot of flavor. Pinned! 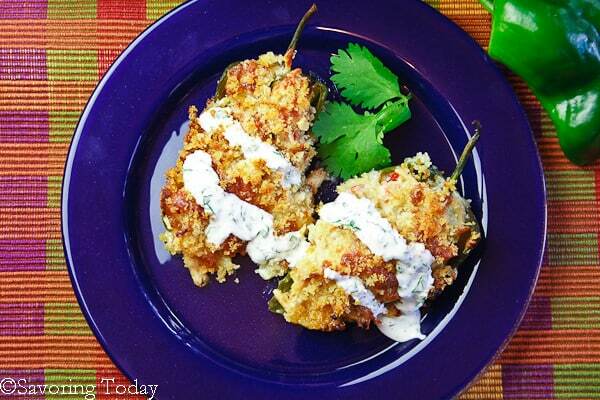 Well you just took the boredom out of chile rellenos! My husband picked up some chicken thighs from Costco yesterday and I gave him cedar planks for his birthday. So there is no excuse for me not to make these. I can’t wait to try them. Thanks for a sharing this great recipe Judy! Fried onions really do have so much flavor! They do take a bit of time, but they’re so worth it. This recipe is definitely worth waiting for! Sooo good. Thanks. wow! These look really amazing! I like your presentation. I thought you had stuffed each pepper – this is much easier! And I have poblanos ready to be picked in the garden… thanks! Hi Mimi, thanks for stopping by! I know it looks like a long recipe, but it really is pretty simple. I am envious that you have poblanos in your garden (fresh is always best), I have to wait for the farmers market to open. Another benefit of being neighbors, is sharing in your wonderful recipes. This is one you have to try! Such a joy to share good food with you, friend! You have always helped make me a better cook!